Thanks to Rabbi Eric H. Yoffie for writing today’s strip. (Via Jerry Coyne). The image is Voyager 1’s Pale Blue Dot. Auhor, all I can say is wow. You keep doing it. Great strip. I feel this “.” big!!!!! The meaning of life is what WE give to it. And for anyone who wants to learn a little about scales of the universe…. And what exactly is wrong with being insignificant on a universal scale? Are they really that mentally fragile and insecure? Oh wait.. yes, yes they are. While this ‘speck’ thing is intended as a (jewish, accodring to Jerry) joke, I believed it is the true reason behind all supernaturalness. An insignificant speck, loneliness, meaningless deaths, fear of dark .. all of these are true in the sense factually true, while many or most people are not ready facing them. Thus the creation of ‘something else’ that is ‘larger than death’ etc. That is that, even if it is not true, it is less intimidating for those who don’t think deep enough ..
Pascals wager, the ontological argument, and now Argumentum ad Consequentiam. Just when I think it can’t go any further, there it goes. Another level of dumb. It’s like this amazing onion. Keep peeling off the arguments and there an even dumber one revealed. @ gk4ca I didn’t get the Jewish bit in the speck. Wouldn’t that have to be schpeck? “Man is but a reed, the most feeble thing in nature, but he is a thinking reed. The entire universe need not arm itself to crush him. A vapour, a drop of water suffices to kill him. But, if the universe were to crush him, man would still be more noble than that which killed him, because he knows that he dies and the advantage which the universe has over him; the universe knows nothing of this. It makes one wonder. Do they just spew this stuff out without thinking? Do they even HEAR themselves or realize what they’re saying? Wow! Dismal prophets are a pain in the neck. 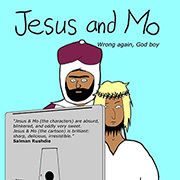 I love all these Jesus and Mo strips. I have no special accolade for this one, just a general admiration for all of them. These make me feel part of a larger community of atheists, even if I seldom meet any “in real life”. How many times have we heard theists tell us that without god we cannot have morals. “Some universe, some speck” Nasser Ben Houdja. What’s dismal about realising what you are? Is it dismal to grasp life with both hands and enjoy every moment you’ve got. Or is it dismal to waste precious hours of your life in a church/mosque/synagogue indulging some fantasist and their mental delusions? Not just visually powerful, but fine use of the sound track. Your name seems very familiar. It was the name of the abbot of a short lived Anglican Benedictine community on Caldey Island in Pembrokeshire, near my home. I have something of an interest in local history, so I know a bit about them. They were very into neo-Thomism as I recall, were often best by financial problems, and converted to catholicism just before WW1. Is your name a coincidence? David B — Abbot Carlyle & I chose the same 12th century Yorkshire Cistercian as a patron saint — the Caldey community actually split — the RCs ending up in Prinknash & the Anglicans going to Pershore, then Nashdom (where our founding fathers were trained), then Elmore & now Salisbury Cathedral). Very profound. That is all this speck has to say on the matter. Thanks for that, Prior Aelred. I’d forgotten about the split. As I now recall, Carlyle and some others converted to RC, and I have a memory that he moved to Canada? I personally know something about the monastic life, though not in a Christian context. Some decades ago I was an ardent Transcendental Meditationist, and spent between two and three years living a monastic life working for my (then) spiritual master. I still sometimes wonder whether Maharishi Mahesh Yogi was a fraud, pure and simple, or as much a victim of the positive reinforcement given to him by his devotees, and the indoctrination he got from his master, as the devotees were victims of him. Then again, I wonder the same thing about assorted Popes, and the likes of Billy Graham and Pat Robertson. I hope I won’t be accused of spamming if I invite you to the discussion board I frequent, and co-founded. I don’t think this is the place for the sort of discussion of monasticism – and indeed of religion – I’d like to pursue with you, if you are interested. You can find it by clicking on my name. yet, us non-beleivers are arrogant because we learn, define and understand things for ourselves. Just a spec. I have often wondered why so many of us ask ourselves “what’s it all for?” and the one answer I keep coming up with is: the thought of death often makes people feel irrelevant or meaningless. “If we don’t live forever, then what’s it all for?” Perhaps this is all it’s about. Reminds me of the immortal Pythons and the Galaxy song! @ HaggisForBrainsDS7 I’d like to endorse your praise for the rabbi. He may be deluded and his argument may be from consequences, but at least he’s not a hate monger like so many who claim atheists are the root of all evil. I’ve always enjoyed the synagogue sermons. The rabbi is often a stand up comedian with a message, and far more fun than the average hellfire and brimstone Christian. I’m not sure that Moses is right about preferring false belief over no belief, historically the greatest slaughter has been between “big endians” and “little endians” rather then boiled eggers and bowl of cornflackers. that photo always makes me think of Carl Sagan, and http://www.planetary.org/explore/topics/voyager/pale_blue_dot.html <– that excerpt in particular. We look like a tiny spec when seen from a wide point of view. That’s a matter of perspective. But by phrasing it as “a mere speck” or “just a speck”, a value judgment is implied that doesn’t at all follow from the observed facts. There is nothing “mere” about being a tiny spec in a vast universe. It’s amazingly – I’d almost say miraculously – cool. There’s another opportunity waiting in the Rabbi’s text, when he refers to momentous encounters with God, including ” the wondering [sic] in the desert”. David B — Carlyle did indeed move to Canada as an RC parish priest — one of our oblates (when a teen) found Carlyle a very gifted spiritual director & has dedicated a brick to his memory in our “donors’ wall” — Carlyle did return to the monastery as an “intern oblate” prior to his death & was buried as “father founder” in the monastery cemetery. David B. Have you ever divulged your mantra to anybody? I was persuaded by my husband to learn TM. He swore it helped him relax after a stressful day in the office, but it lead to insomnia in my case. Though my “instructor” said that my mantra had no meaning whatsoever, I could only remember it initially because it was very close to a German word. Fortunately we did not waste too much money on the bearded yogi. I haven’t, because no-one has asked me since I stopped taking it seriously. The mantras were given out according to age, and modified in advanced techniques. They are all available on line. I’m happy to talk about my TM experiences at my favourite discussion board. Or here, if asked, but I regard here as more about commenting on the latest J&M. That Carl Sagan quote always chokes me up. It’s just incredible that, by sheer chance, we all exist at this moment in time on this tiny ball of dirt hurtling through space at 30 km/sec. News break! Even with your god you are no more than a tiny speck, albeit a noisy one. Well, @ jerry w, right on. It also seems to me that it’s so obvious that even WITH any god, one is still a tiny speck in the vastness of the universe. @Author – Fantastic! Thank you for helping me smile today. @Blakey – It does for me as well. I remember it well. 10th Grade. Gave me the chills at the time. It was the very speech that made me take that final step away from the tiny existence taught to me at St Alban’s every Sunday. To imagine, to allow for the glory and magnificence that is this reality to finally outshine the poorly built ide of a “God” in my mind. I feel more secure. More humble. More special and more important knowing I am a mote of dust on a mote of dust. It is right. It is the Truth I was always searching for. I ralized how truly special life was. That it is rare and fleeting and should be cherished all the more, because of it. No grand and glorous creations, are we. No chosen existence. But one that is all the more precious because of it’s unlikelihood. All the more wonderful for me to be alive for ths tiny fluttering of time in the universe. I was inert matter for billions of years. I will be inert matter for billions more. But for this one blink. This one minute tick on the watch of time, I AM ALIVE. I get tearful with joy and gratitude every time I think about it. It’s why I smile when it rains, as well as shines. Why I tell my children how much I love them, every chance I get. Why I will not raise my hand in violence unless necessary. Existence, concious thought, awareness of self, is too precious to squander on anything pointless. I live to love and love to live!!! The opprobrium against being a “mere” speck is the same as the hostility to the notion that we are “mere” matter – the “mere”-ness of it is assumed a priori. 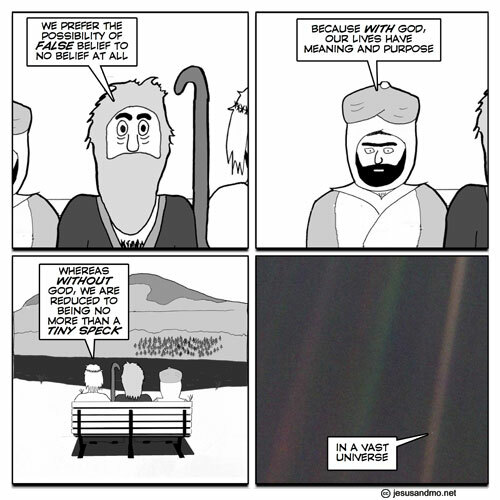 If there’s no god then it’s meaningless to call matter – and ourselves – “mere”. 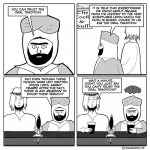 Mighty pleased to become aware of ‘Jesus and Mo’. After a day of interacting with simple-minded bigots, it’s nice to get a healthy chuckle. I do now periodically share J&M with Facebook pals. Please continue to exist. Thanks! Being this speck (not a “mere” speck, but a mother-fo’ing speck!!!) is awesome. I can’t believe I’m here. 😐 Crazy times! In the vastness of this universe and assumed ones beyond (or before and after), and the empty wastes of dead space and light-years distances between our worlds and others, to think that my forebears crawled out of the slime 9 digits of years ago, and now I, a pinnacle of that progression, sit behind a computer at a desk and get annoyed by customers’ problems! One of my favorite images. The new (2014) earth from mars picture is my wallpaper and will remain so.